Chronic dialysis patients or chronic kidney disease (CKD) patients on dialysis are among those heavily burdened by their disease which is why any assistance received in the form of Philhealth benefits or PCSO aid is much appreciated. However availing of PWD benefits among CKD patients remain to be a problem. CKD patients on dialysis are among those affected by the exclusion of chronic illness among those considered PWDs. It has already been years since we petitioned that chronic dialysis patients be considered PWD since Secretary Soliman’s time). 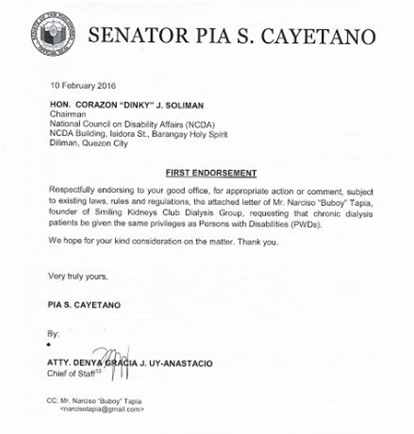 In fact, we have obtained an endorsement from former Senator Cayetano for our inclusion in the PWD benefits. CKD’s current exclusion by the National Council for Disability Affairs stems from the contention that CKD is a disease (like polio) and not a disability. Currently, CKD patients who are to be issued PWD IDs are those who already have physical/orthopaedic or psychosocial disabilities. Apparently, the common belief is that CKD becomes a disability only when a patient cannot walk or has restrictions related to mental health conditions. However, this belief is inconsistent with the definition of disability under Republic Act 7277. Please take note of the terms “physiological or anatomical function”. The kidney is also part of the human anatomy with many crucial physiological functions like filtering waste from our food intake and drugs, regulating and filtering minerals from blood, help produce red blood cells, regulate blood pressure and promote bone health and maintaining overall fluid balance. With CKD, these functions are impaired or start to fail or are already failing. With these, CKD fulfills the disability definition. Not to mention CKD often comes with other problems like diabetes mellitus. Therefore, what makes CKD itself a disability is because kidney function ( if not with impairments only) has already failed accompanied by other impairments in body function affecting daily living like impairment in blood pressure control (hypertension), impairment in red blood cell production (anemia) and impairments in regulation of electrolytes (ex. Increased potassium in the blood), among many other impairments. CKD is even more “disabled” than those without limbs as failure to have dialysis eventually results in death preceded by manifestations of all disabilities as expected when the kidney fails. A CKD patient even if he is able to see or walk or hear or think clearly is already considered disabled by virtue of the aforementioned impairments. The dialysis machine for us is like an assistive device just like a wheelchair is for those with mobility issues. Remove a wheelchair, and a person without limbs remains to be considered a living disabled person. Remove the dialysis machine and we lose all bodily functions and die – more than disabled. CKD like other chronic illness is a disability classification of its own. It is considered an invisible or hidden disability --- a disability that is not immediately obvious but nevertheless is entitled to the benefits of a PWD. The UNCRPD recognizes it. Social Security of the US recognizes it. 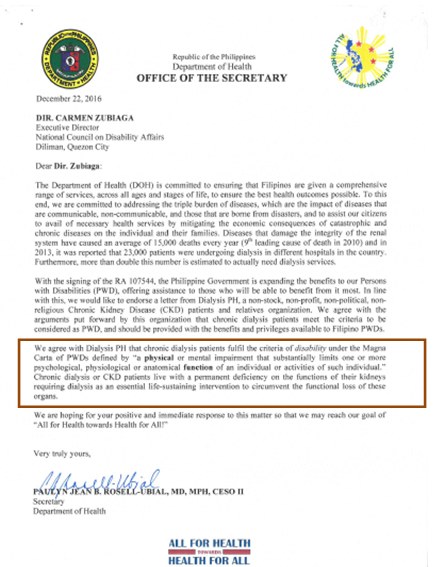 Even our local SSS recognizes it and our own Department of Health Secretary which works hand in hand with NCDA also acknowledges it as shown by the attached letter by former DOH Acting Secretary Ubial. Unfortunately, NCDA Executive Director Zubiaga does not agree. So we humbly request your office to ask the NCDA leadership especially Dir. Zubiaga to re-examine and reconsider their position regarding chronic dialysis patients or CKD patients as PWDs by revisiting the definition of disabled, by weighing in facts and expert statements from lawmakers, the Department of Health, the international community including the global community of persons with disabilities and the UN Convention on the Rights of Persons with Disabilities of which the Philippines is a signatory. #CKDisPWD . And we need your help. Please consider chronic dialysis patients as persons with disabilities as other qualified persons with chronic illness should be. 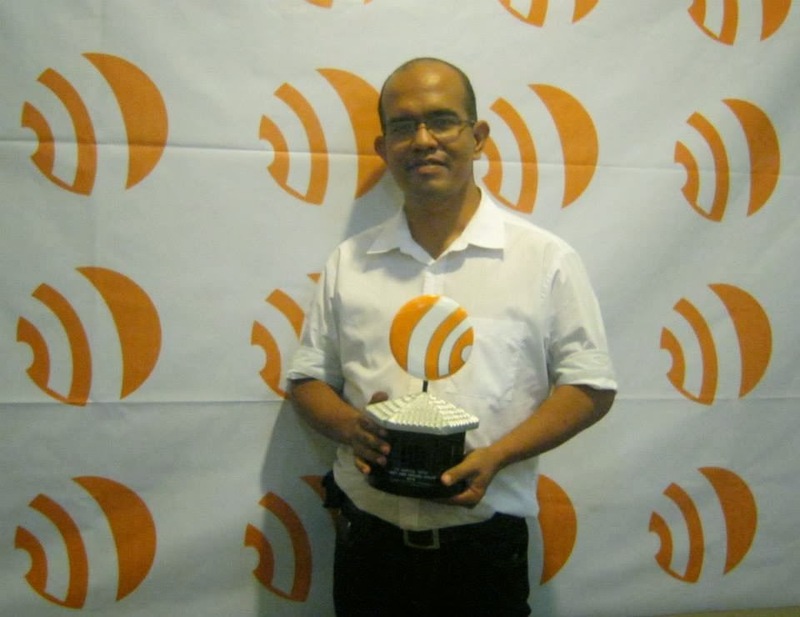 In behalf of chronic dialysis patients in the Philippines.